Quite simply Blackjack Surrender is an option that is allowed at some blackjack games where you can surrender your hand back to the dealer for half of your initial stake money. It’s an option or tactic that can be used to control your losses when you’re seemingly faced with a weak hand against a dealers strong open card. Early Surrender – when all cards have been dealt. If the dealer is showing an Ace you can surrender before he peaks for Blackjack. Late Surrender – Where you’re able to surrender your hand after the dealer has checked for Blackjack and before you draw a 3rd card. Why should you surrender your hand? Surrendering your hand is often a good tactic when you have a relatively weak hand and the dealer is holding a strong card, like a 10 or Ace against a fifteen or sixteen in your hand. The odds of you busting out with such a hand are higher, so playing with the rules of probability and basic standard strategy it can be a good tactical play for helping to maintain your bankroll and limit your losses. It’s a viable tactic and a very good one because it reduces the house edge by a further 0.10%. This is why you won’t see many blackjack games offering it. However there are a couple of Live casinos where you can find the facility and I’ll tell you about them later. When should you use Blackjack Surrender? There is a standard strategy of when to surrender your hand and it is dependent on the number of decks being played and also whether the dealer has to hit on a soft 17. For the purposes of this article i’ll show the rules for a 6-8 decks game, as that is what all live casinos have and both options for soft and hard 17’s. 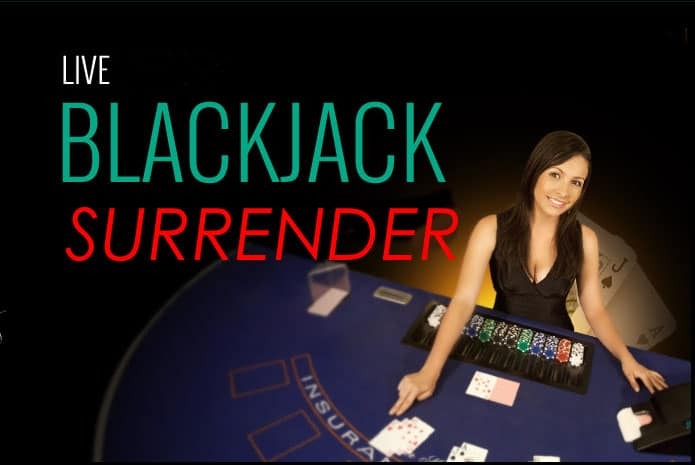 Where can you find Blackjack Surrender for Live Casino? Rather unbelievably there are two live Casino software providers that provide blackjack surrender. Ezugi has Early Surrender, whereas at Visionary iGaming casinos you can Late Surrender if the dealer doesn’t have Blackjack. In the realms of Blackjack, Early Surrender is quite rare to find!